Slave DNS service is for someone that host's there own Name Servers and wants us to pull updates from those. It is set up by simply enabling Slave DNS and specifying the IP for the Name servers that we should be pulling DNS updates from. The illustration below shows how its properly setup. 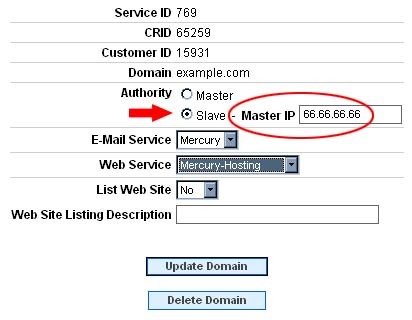 Slave DNS can be used in conjunction with Mercury hosting other services such as E-mail. We only do Back-Up email for customers that have a Back-Up E-mail and Slave DNS rate on their account. If we provide Slave DNS and a customer has the proper MX record configured on their Name Server, Back Up E-mail will be automatically available with no configuration necessary.